Jerral Wayne Jones Sr., commonly known as Jerry Jones, is a famous American businessman, former football player, as well as an enterpreneur. Jerry Jones is perhaps best known as the CEO, as well as a general manager of a popular American football franchise called “The Dallas Cowboys”. Considered to be the most valuable team in the entire NFL league, “The Cowboys” are valued at approximately $3 billion, while the estimated earnings that they generate every year amount to an impressive $560 million. “The Cowboys” are not only the most popular team in the National Football League, but they are also five-time Super Bowl Champions, ten-time Conference Champions, and twenty-one time Division Champions. Some of the inductees into the Pro Football Hall of Fame such as Troy Aikman, Larry Allen, Emmitt Smith, Jackie Smith and Rayfield Wright all at some point played for “The Dallas Cowboys”. Needless to say, the team generates a huge amount of profit to its owners. A famous businessman, how rich is Jerry Jones? 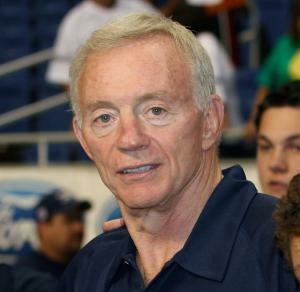 According to sources, Jerry Jones’ net worth is estimated to be an impressive $4.2 billion. Undoubtedly, the majority of Jerry Jones’ wealth and net worth comes from his business ventures. Jerry Jones was born in 1942, in Los Angeles, California, but his family moved to Arkansas later on. In Arkansas Jones attended North Little Rock High School, where he played as a running back for the school’s football team. Jones then continued his studies, as well as his football career at the University of Arkansas where he played under the famous football coach Frank Broyles. Jones was part of the team, which featured such future football stars as Ken Hatfield, Jimmy Johnson and Jim Lindsey. Jones graduated from college in 1965 and was immediately offered a job at an insurance company run by his father. At the same time, Jones decided to continue his studies and in 1970 graduated with a degree in business. At the very beginning of his business career, Jerry Jones did not do as well as he had expected in terms of making profitable decisions. One of his major failures and early mistakes happened in 1967, when Jones did not use the opportunity to purchase an American football team called the “San Diego Chargers’’. Prior to associating himself with “The Dallas Cowboys”, Jerry Jones went on to launch a business for gas and oil exploration, which developed into a largely successful private business and significantly contributed to Jerry Jones’ net worth and wealth. In 1989, Jones bought “The Cowboys” from its previous owner Bum Bright for a price of $140 million, and he is still the CEO of the team till this day. Even though he is among the richest businessmen in the industry, Jerry Jones never really enjoyed success and fame among the football fans. Not only was he named the least favourite sports personality by the “Sports Illustrated” magazine, but also managed to anger the fans due to his questionable decisions, as well as lack of wins in the franchise. 1 Father of Stephen Jones. 2 He and Jimmy Johnson were college football teammates at the Univeristy of Arkansas. Johnson was later hired as head coach of the Dallas Cowboys.